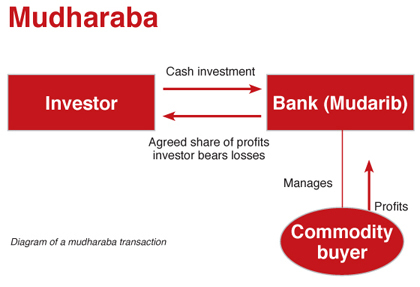 Mudarabah is a contractual relationship executed between two parties, one supplying the capital (rabbulmal) and the other supplying the labor and skill as agent or manager (mudarib), for investing in a pre-determined activity, which grants each party a share of the earnings as determined at the time of the investment. This practice existed in the pre-Islamic period and Muslim jurists of all the major legal schools are agreed on the legitimacy of Mudarabah transactions. Mudarabah business can be of two types: restricted, if the capital-provider specifies any particular business in which the capital is to be invested, and un-restricted if the capital-provider authorizes the mudarib to invest the funds in any business he deems fit. Profit is shared between Both the parties according to a pre-determined profit sharing ratio. The profit sharing ratio has to be mutually consented upon and explicitly stated at the time of contracting and has to be a proportion of the profits. And the payment of profit to the financier cannot be in the form of a fixed amount or any percentage of the capital employed. Furthermore, the earned profits cannot be distributed until all the expenses have been paid, in accordance with custom and the original agreement. Being a manager to the financier, the mudarib undertakes the business and shares in the profit. He is considered as a trustee with respect to the capital invested, his actions must, therefore, be conforming to the overall purpose of the contract and within the recognized commercial practice. The rabbulmal can also contribute his labor subject to the permission of the mudarib. In addition, the mudarib does not share in any financial losses which are borne solely by the rabbulmal. The mudarib‘s losses are deemed to be the opportunity cost of the manager's workforce which has failed to generate sufficient revenues for a business the profits of which are shared by both in accordance with agreed terms. The Mudarabah contract can be terminated by either of the two parties at any time as long as a notice, per the contract terms, is given to the other party. A maximum term of the Mudarabah contract can be set automatically where after the contract is terminated. Furthermore, for the purpose of periodic profit distribution in a running business before the termination of business, the business has to be liquidated constructively by way of valuation of the assets by the mutual agreement of the partners. A final settlement is only possible at the time of the termination of the business.